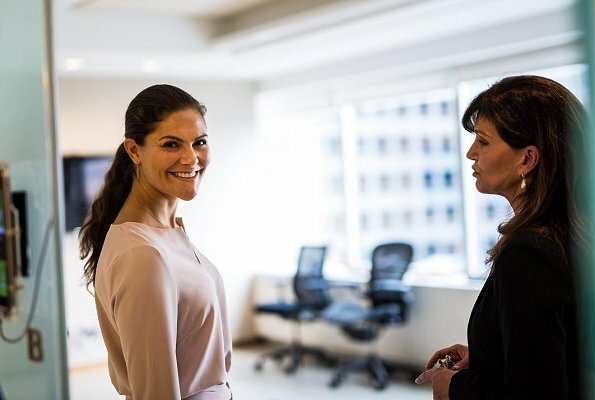 Crown Princess Victoria of Sweden is visiting New York city of USA between the dates of September 20 and 24. The Crown Princess will attend the official opening of UN General Assembly meeting and will meet with UN's global targets' ambassasadors. On the first day of her visit, the Crown Princess visited New York City Hall and met with Deputy Mayor Alicia Glen. 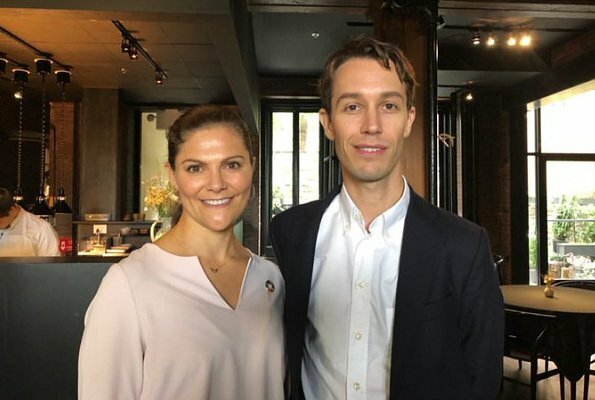 The Crown Princess then visited Aska Restaurant in Brooklyn and Swedish-American Chamber of Commerce. As always, he smile is her best accessory. This suit (pyjama) does not do anything for her. Very lovely outfit. More youthful than her usual style and it shows she's in really great shape for a woman of 40+. I like her look! And of course her smile too! Nice and sober outfit and soft colour, it gives the right impression about her personality. A lovely lady with her fashion , her gracefulness and fashion. Muuch better than her usual of late, fresher, younger, more contemporary. I don´t get the pyjama vibe (was thinking more along the lines of a judo suit), but in any case I think the colour is too pale for her. Or at least she shouldn´t have gone all monochromatic/pastel. She looks great here. Love her long healthy hair. This is definitely one of the best outfits I've ever seen CP Victoria in! Wow! This is a bit pajama/judo looking. I agree it could be the pastel monochromatic look. But the fit complements her and thankfully there is no floral involved! So happy about that, but as usual, wish she would let her hair down sometimes. I quite like the pale pink suit and I love the dress. And as ever she is gracious and smiling. This pantsuit is a bit too blend, but love the dress nice color combination and a perfect fit. Not keen on the colour or style of the pyjama suit but the dress is beautiful. She looks fantastic in it.